Discussion on innovation of management mode of machinery and equipment in Nonferrous Metallurgical Enterprises YANG Zhi-hong;Yunnan Yun Tian Consulation Co.
Research on non-ferrous metal safety management and fulfillment of social responsibility HUANG Chu-ming;Guangxi China gold south of the Five Ridges Mining Co. Application of logic controller in electric transformation of crane LIU Kun;CHEN Le;ZHOU Hong-hai;Shandong Lu Zhong steel logistics Co. Analysis of Energy Saving and Consumption Reduction of Positive Dense Phase Pneumatic the Ashconveying System's Logic Optimization WANG Shou-bin;Datang Lubei Power Genertion Co. Influence of weld thickness on porosity of aluminum alloy robot welding WAN Jia-xin;LI Ke-ying;BYD Automotive Industry Co.
Research on installation technology of mechanical and electrical integration equipment LI Rong-jian;Shandong Zhicheng Construction Project Management Co. Analysis of materials and selection principles for mechanical parts manufacturing LIU Qiang;CITIC Dicastal Co.
Research and application of horizontal shallow hole pre splitting blasting technology in refractory and fractured orebody ZHANG Hu;XIE Jia-hui;Chifeng Chaihu LAN Zi Gold Mining Co. Comparative study of flash smelting and oxygen enriched side blown smelting process HE Yi-lin;Changsha Nonferrous Metallurgy Design and Research Institute Co. Analysis on the development direction and development measures of carbon for aluminum ZHANG Hong-yu;GUO Ying;Engineering Department of Shanxi Liang Yu Carbon Co.
Research on the application of intelligent manufacturing technology in metallurgical equipment production CHEN Qing-jiang;Shandong Siyuan Water Industry Engineering Co.
Research and development of mechanical equipment in smelter and manufacturing technology research SU Jian-wei;Shandong Siyuan Water Industry Engineering Co.
Design and optimization of 125t refining furnace and its equipment XU Ya-gang;MCC-SFRE Heavy Industry Equipment CO.
Research and Application of Casting and Spinning Process of Aluminum alloy Wheel Hub LI Guo-dong;BAI Fei;WANG Qiong-ya;Sanmenxia Dai Ka hub Manufacturing Co. Relationship between vein rock and tectonic mineralization in the Da Liu Hang area, Penglai, Shandong SUN Yong-lian;Shandong gold gold Innovation Group Co. Application of new surveying technology in mine surveying in Hebi City ZHANG Zhi-yuan;YUAN Jian-min;Henan Fu Chang Construction Engineering Co. Application of integrated geophysical prospecting technology in mine geological exploration JIN Jun-jie;Changsha Nonferrous Metallurgy Design and Research Institute Co. Application of drilling construction in geological resources exploration ZHANG Jian-jun;Changsha Nonferrous Metallurgy Design and Research Institute Co.
How to strengthen the management of the use of mine machinery and equipment WEI Ru-yuan;Pingdingshan Tianan Coal.Mining Co. Fault characteristics and maintenance of mechanical equipment in mine engineering LIU Guang-hui;Pingdingshan Tianan Coal.Mining Co. Discussion on the safety problems and solutions of mine machinery XU Qi-xiang;Pingdingshan Tianan Coal.Mining Co. Difficulty in separation of cupric sulfide ore and progress in technology and technology WANG Fei-long;GONG Qiang;HE Guo-chun;Qinghai the Yellow River Mining Co.
A brief talk on the continuous mining technology of metal mine underground ZHOU Guang-xin;Xinjiang karat Tong Ke Mining Co.
Study on comprehensive utilization of tailings in lead and zinc concentrator TAN Xiao-yuan;Kunming cetla Mine Engineering Design Co.
Study on the mineral processing of a nickel cobalt ore in Xinjiang GONG Qiang;HE Guo-chun;WANG Fei-long;Qinghai the Yellow River Mining Co. Experimental study on mixed gold extraction of gold ore and lead-zinc ore CHE Sheng-yong;Zijin Mining Co. Experimental Study Of New HP-1 Xanthic Acid Sodium In Flotation Of Pyrite WU Jin-xin;Shaanxi Huaguang Industry co. Application of high water consolidation backfill mining method in non-ferrous metal mining ZHANG Shi-quan;Sinosteel Maanshan Institute of Mining Research Co. Discussion on reducing production rate of mixed rock in mine production exploration HAO Shi-kun;China Hua Ye science and Engineering Group Co.
How to strengthen the management of mining and stripping equipment and improve production efficiency CHENG Li-feng;Inner Mongolia Hulun Buir Dongming mining industry Co.
Fluid mixing mineralization mechanism in Qinglong antimony deposit, Guizhou, fluid inclusion and stable isotope evidence WANG Jin-jin;HU Yu-zhao;MEN Wen-hui;Xi'an geological and mineral exploration and Development Institute Co. Selection and transformation of mining methods in Jinhong Ling nonferrous mining area, Chifeng mountain ZHANG Shuo;Chifeng Jinhong mountain non-ferrous Mining Co. Behavior mechanism of magnesium silicate minerals in flotation separation system of copper nickel sulfide ore HE Guo-chun;WANG Fei-long;GONG Qiang;Qinghai the Yellow River Mining Co.
Geological characteristics and prospecting direction of the copper deposit in the Ma Gou Liang area, Bogda mountain, Xinjiang WEN Zhi-gang;LIU Song-bai;LI Hai-bo;Shaanxi Research Institute of Geology and Mineral Resources Co.
Geological features and prospecting criteria of Nalunaq gold deposit in South Greenland ZHOU Cong;Sinomine Resource Exploration Co.
Common fault analysis and maintenance of mine crane CHEN Le;LIU Kun;Shandong Lu Zhong steel logistics Co.
Finite element analysis of driving sprocket for hydraulic rock drill trolley ZHANG Qi-zhi;SUN Xiao-liang;Jiangxi Xintong Machinery Manufacturing Co.
Development measures for exploration and prospecting technology in geological and mineral construction HU Yang-jun;Shaanxi Research Institute of Geology and Mineral Resources Co. Analysis of mine geological prospecting engineering technology SHI Hong-ye;ZHANG Fang;Liaoning Pak Mountain Gold Mining Co. 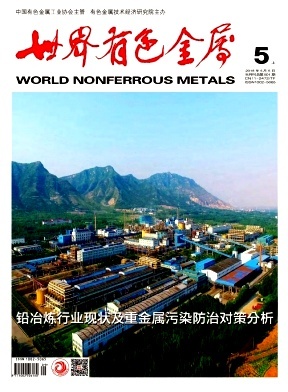 Practice of two round prospecting in Yinshan Mine WEN Hao;Jiangxi copper group Geological Prospecting Engineering Co. Application of UAV in surveying and mapping of mine topographic map YUAN Gui-hong;WANG Ji-hua;Liuzhou Research Institute of water and Electric Power Survey and design;Liuzhou Zhongnan Survey Co. Analysis of hollow three encryption in aero Photogrammetry LIU Ping-ping;Ji'nan Tianrun land consolidation planning Consulting Co. Discussion on the development and application of topographic survey and Mapping Technology ZHANG Sheng;Jinan Tianrun land consolidation planning Consulting Co.